At a consistently lean 6'2," green-eyed Timothy Dalton may very well be one of the last of the dying breed of swashbuckling, classically trained Shakespearean actors who have simultaneously forged successful careers in theater, television and film. He has been comparison-shopped roundly for stepping into roles played by other actors, first following Sir Laurence Olivier in Wuthering Heights (1970), then as James Bond in Living Daylights, The (1987) and Licence to Kill (1989), and even more brutally recently as Rhett Butler in "Scarlett" (1994) (mini). Undaunted and good-natured, Dalton has always stated that he likes the risk of challenges. He was born on March 21, 1946 in Colwyn Bay, North Wales, where his father was stationed during WWII, and is the oldest of five children. Although born in Wales, he is quick to point out that he is mixture of Italian, Irish and English. His father moved the family to Manchester in the late 40's where he worked in advertising and raised the growing Dalton family in an upperclass neighborhood outside of Belper, Derbyshire, just south of Manchester. Dalton was enrolled in school for bright children where he excelled in sports and was interested in the sciences. He was interested in acting from a young age, perhaps due to the fact that both his grandfathers were vaudevillians, but it was when he saw a performance of Macbeth in 1962 at age 16 that his destiny was clinched. After finishing the British equivalent of High School 1964 at age 18, Dalton toured as a leading member of Michael Croft's National Youth Theater for for the summers of '64, '65 and '66. Between 1964-66, Dalton studied at The Royal Academy of Dramatic Art (RADA). Just before completing two years, he quit RADA and joined the Birmingham Repertory Theater and played the lead in many productions under the direction of Peter Dews while at the same time turning professional. Dalton later said of RADA in an interview with Seventeen Magazine (Dec. '70) "It took a year to undo the psychological damage that was caused by the oppressive teachers." 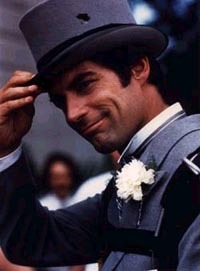 Timothy Dalton's talent and classic good looks immediately landed him professional work in television, guest starring as well as a guest on an episode of the short-lived TV series, Judge Dee ('66), and as a regular on the 14 episode series Sat'day While Sunday with the young Malcolm McDowell. In late 1967, 'Peter O'Toole' recommended the 21-year old Dalton for the role of the even younger King of Philip of France in Lion in Winter, The (1968). Coincidentally, this was also Anthony Hopkins's big break. The following year, Dalton starred in the Italian film, Giochi particolari (1970), with Marcello Mastroianni and Virna Lisi, although he was dubbed entirely in Italian. Dalton also mixed in a healthy dose of BBC work during this time, including The Three Princes ('68), Five Finger Exercise ('70), and Candida ('71). Also during this time he was approached and tested for James Bond in the film On Her Majesty's Secret Service, but he turned it down feeling he was too young for the part. Since then he has gone on to do countless other movies, shows, and plays: including finally playing 007. 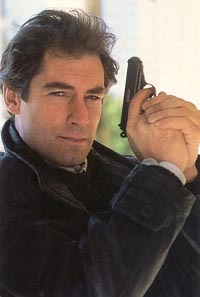 Timothy Dalton was praised by many as being the only actor to stay true to Fleming's Bond. However, many more discredited him due to his radical change from the Bond of the films. While he was Fleming's Bond, he just didn't do well for the series. For the past twenty-five years, Bond fans had grown used to a certain persona for James Bond, and Dalton was too drastic a change for most. He played the role with a seriousness that was, at times, scary. He rarely smiled and when he did it seemed forced and fake. Not to say that Dalton is not a fabulous, talented actor, because he is extremely talented. A world renowned Shakespearean actor and star of countless movies and plays, Dalton has a quite distinguished resume. Unfortunately, his Bond just came at the wrong time. The Cold War was just about a memory and the people wanted a suave, humorous, tough but lovable Bond to discover all over again. Instead, they got a secret agent who's personality was that of a true, Cold War spy. The Living Daylights's script was one of the best of the series, however, the Bond just wasn't right for the era. Perhaps if Dalton had more time to develop his character, but he didn't. Bob: Were the Bond movies hard work or a walk in the park? Dalton: It's neither. Well, it's both. No, it's hard work. Sorry, I'm kind of jumping around. It's a certain kind of movie. All movies are hard work because you're trying to get them right and do your work well. Most movies - and certainly the Bonds - are simply hard physically because you're often working 14 to 15 hours a day on very long schedules. Bob:Did you do your own stunts on the Bond films? Dalton: I was involved in them. I didn't do anything that is going to break my neck. In those days there was never a stunt or a moment in a Bond movie that hadn't been done for real. Nowadays we're so used to what you can achieve with computer graphics. Bob:Do you drink martinis, and if so, how prepared? Dalton: No, I don't. I've always found martinis knock me sideways. I don't think I've drunk one since I left the Bond movies. Every bar, every restaurant you go in, there's always some wisecrack, 'Oh, yours will be a martini, shaken, not stirred.' You get sick and tired of that.